Come row with us! Join us for our recreational rows every Sunday at 9:30 am and Tuesdays at 6:30 pm. It is a perfect time to come out, meet our members, and join us for some fun on the bay. Contact us for more information. This is NOT a slim racing shell. Whaleboats, or “Monomoys” were used in life-saving and whaling for most of the 20th century. 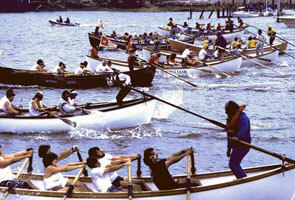 These open-water boats weigh about one ton and carry a crew of ten: 8 rowers, a coxswain and a bowhook. 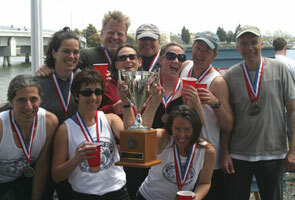 The Embarcadero Rowing Club has men’s, women’s, and co-ed teams that compete in both Spring and Fall race seasons. Courses and conditions vary from 2-minute sprints to 45-minute endurance races. Our boat is docked most of the year on the San Francisco Bay next to the Mariposa Hunters Point Yacht Club. From there, we row from the Bay Bridge to the Golden Gate, with the occasional stop at McCovey Cove. 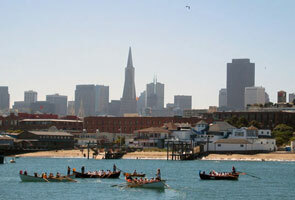 We also row in the SF Marina, around Alcatraz, the Oakland estuary and Lake Tahoe during race seasons.